Skylights are a cost-effective way to make your home feel more open and spacious. At Williams Roofing Company, we understand how natural light changes the atmosphere of a home. Just adding one or two skylights can transform a room from ordinary to spectacular! Brighten a room. Installing a skylight can maximize natural light in darker areas of your home. Where there’s no exterior wall to put a window you can create a window in the ceiling with the installation of a skylight. Save on energy. Skylights can help cut down on your electric bill. Strategically placed skylights replace the need for electric lighting. They also add heat to your home, cutting down on the amount of electric or gas heat you’ll need to generate. This can translate into big savings. Preserve the environment. Because skylights save electricity and gas, modern energy-efficient skylights are considered a “green” home innovation. Plus, you can feel good about helping to reduce your carbon footprint. Increase home value. Skylights increase the overall value of your home. You can usually count on getting back any money you invest in installing skylights in the way of increased home value. 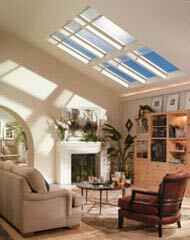 Skylights have a modern appeal, both for their energy-efficiency and for the beauty that they add to any home. Consider adding a skylight to your kitchen, bedroom, bathroom or family room? We can also replace those worn out skylights. Williams Roofing Company will educate you about the various styles and options, and get your new skylight installed quickly and easily. Contact us at (831) 758-2749 or request a Free no obligation estimate online.